What a joy to visit this family, kid, pet and bike friendly cafe at Narrabeen Lake. 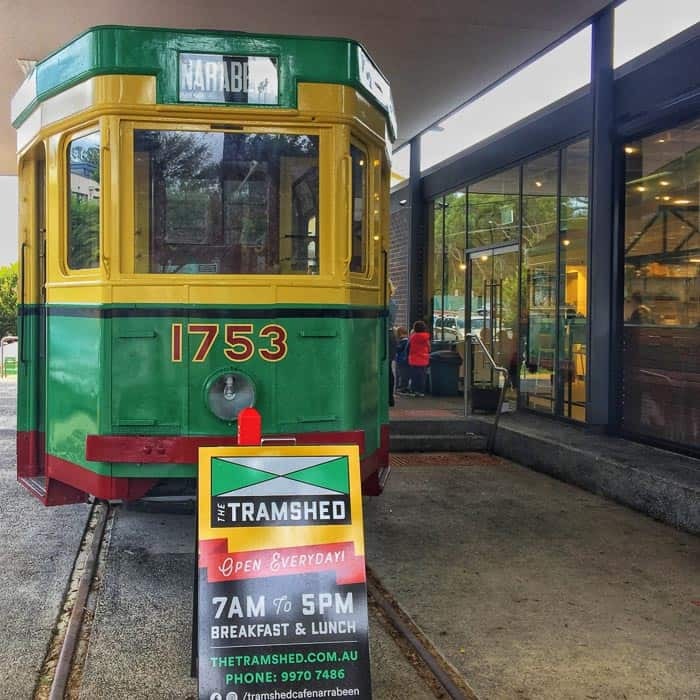 The location is terrific, it’s part of the Tramshed Arts … very close to Narrabeen Lake with it’s marvellous 8km walk and bike loop trail. Even better a magnificent playground is being built right beside the cafe at this very moment, It should be open in July. And then there’s the tram, a restored 19302-era Sydney tram, which was very appealing to the junior clientele when we visited. There is a fence between the tram and the road, nonetheless junior passengers will need to be watched closely by their carers. 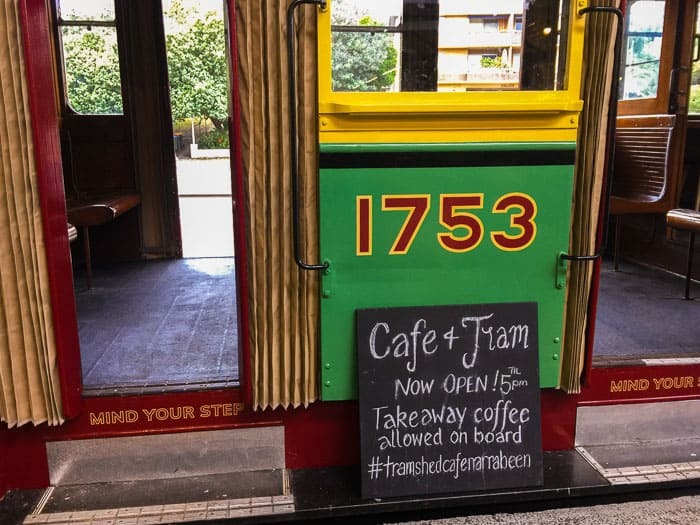 You can buy your food and drinks as takeaway and enjoy eating them in the tram. Such fun for the little ones. Trams used to run from Manly to Narrabeen from 1913 – 1939. 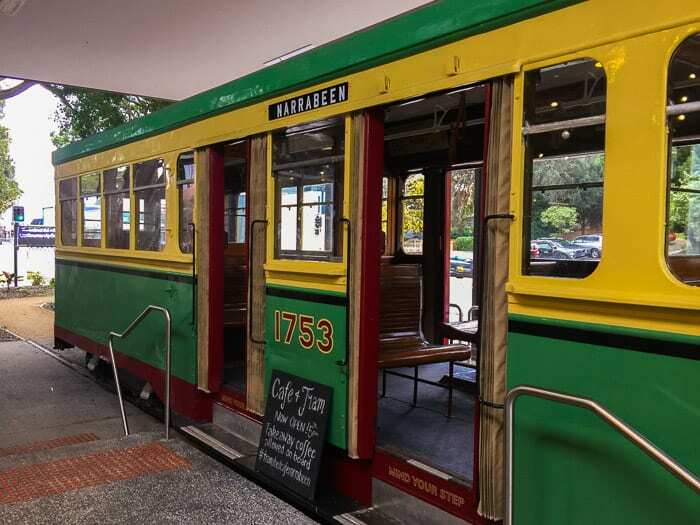 This tram, Number 1753 R-class, travelled between North Sydney and the Spit until 1958. It became very delapidated, but was rescued by Council and the Forest Community Mens Shed to live at the Tramshed Arts and Community Centre. The cafe sells Modern Australian cuisine, with a focus on healthy fresh produce and dishes. When we visited we just had coffees and the raw lemon slice, all very lovely. We’ll have to go back to try out the breakfasts and lunches properly. Book me in for a Kale Quinoa Nest for brekkie, a walk around the Lake and then End Of The Line Fish and Chips for lunch. You can check out the Tramshed cafe menu here. 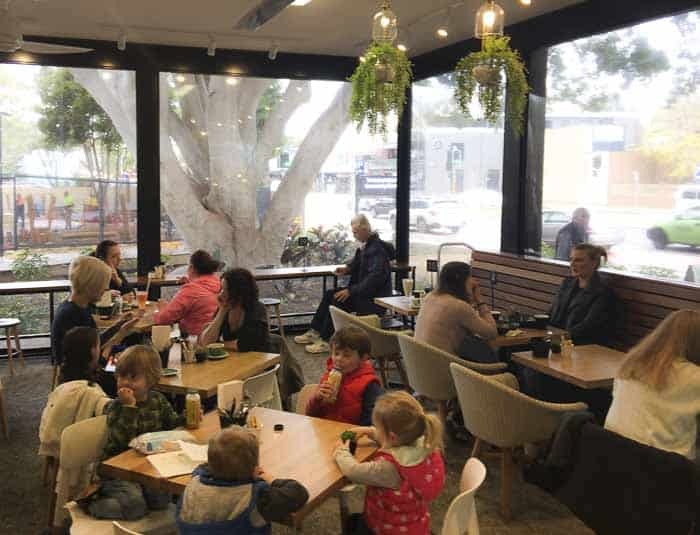 This cafe has such a marvellous location that it might not have needed to put in the effort to be so welcoming to families. 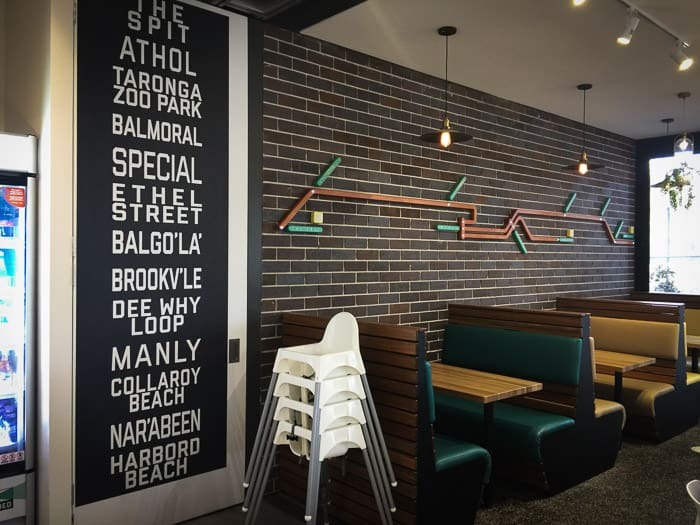 But it has and it’s bound to be rewarded by becoming a Northern Beaches destination cafe. Love the old tram design of the booth seats and the list of stops. There were little kids in and out of the tram, having a lovely time. Bikes can be parked beside the cafe, dogs too.